When I meet people, I tell them that I’ve been on a strict social schedule since moving to the District, but not everything can be glamorous. As such, I spent the better part of yesterday, my 92nd day here in DC (3 months exactly since I flew down), pretty uneventfully… namely, shopping. But getting there was quite an adventure in itself and reflects my time here: You never know where, when, how, and/or with whom you’ll find yourself in absurd circumstances which later become a great story to tell. A friend and I had designated the day for some much needed shopping, but she needed to stop by CVS first. We were leaving the store when we were ambushed by people in Tylenol gear and before we knew what was happening, we were sitting in a Tylenol-branded taxi on our way to our destination. 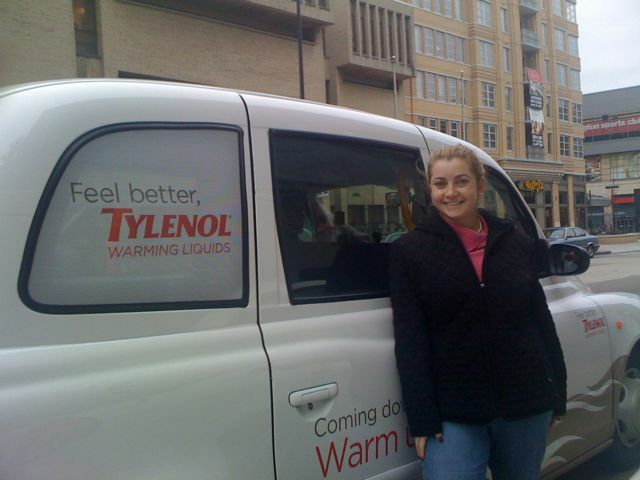 Little did these Tylenol brand ambassadors (as they were called by the taxi driver) know that they had stumbled upon one of DC’s most active marketing bloggers! “Coming down with a cold? Warm up with a free ride” was written on the side of the taxi and my friend and I each received a booklet and a coupon for the new Warming Liquid. Catch a warm ride home. It’s better than catching a cold. It’s starting to get chilly out. And you know what that means. Cold season. So how about it, hop in. It’s on us. A cozy ride. A steamy shower. A warm blanket. When you have a cold, a little warmth can comfort. New TYLENOL(R) Warming Liquids relieve your painful cold symptoms and give you a gentle, warming sensation. So not only do you feel warmer, you feel better. All over. From what the driver told us, this campaign has been going on in cities all over the East Coast. The taxi can only pick up people from CVS (I assume they are a partner in the campaign) and the Tylenol brand ambassadors have to be the ones to usher the passengers into the car. I don’t know if/how this campaign will translate into sales for the company, but it’s certainly an example of how marketeers can think outside the box, raising brand awareness and leveraging viral marketing, all within a cohesive campaign. Overall, this was a unique, memorable experience for me – one that will have me remembering the product and talking to others about what happened. Nicely done on this one, Tylenol! Tonight, I attended the December MobileMonday DC meeting which focused on “Electioneering in the Mobile Age” and had an impressive speaker line-up with representatives from the Giuliani and Obama presidential campaigns as well as from Rock the Vote. The conversation centered around if/how each organization incorporated a mobile messaging component into their overall strategy this past Election season. The Obama for President Committee found high value in texting people on Election Day to inform them of polls that were kept open late, but were unable to find a viable way to message Americans oversees, due to the variety and number of possible systems they would have to test and integrate. In the future we’ll be seeing other entities incorporate mobile campaigns into their marketing strategies through the use of optimized websites, iPhone Apps, and SMS (text messaging). SMS is a key component of a successful mobile campaign because of its guaranteed deliverability, ease and speed of use, and the two-way interaction that it facilitates. And as these mobile campaigns become more commonplace, we’ll see higher levels of sophistication and integration between different social media avenues – in other words, people will be texted a link to a website, they’ll view the optimized website, which perhaps has a YouTube video embedded, and will then share the video with their friends on FaceBook. As a marketing professional, it a relief to know there’s a new medium out there which is successful in getting information to the public. But as an individual, this all concerns me. Of course, there’s a distinction between opt-in marketing campaigns, where you’ve elected to receive the texts, but I’m already experiencing unsolicited advertising coming through with AT&T/Apple sending me promotional texts. (They have my number since they are my mobile service provider.). It’s only a matter of time before all the junk I’m getting in my email comes to my phone and clutters that space as well. SO – What do you think? Are text messages a way you’d want to get information from your political candidates and other companies? Or is your phone a sacred safe zone where ads don’t belong? Yesterday, in my professional capacity, I needed to contact a variety of bloggers directly. As I tried to navigate the blogs in question, I realized that one overlooked aspect of blog design is how/where to display contact information. Openness is an inherent aspect of blogging; you’re putting your opinions, thoughts and knowledge for the world to judge, inspect and interpret… We include links to our twitter accounts, our linkedin profiles, even our pandora radio stations. (Side note: Yay for the power of threes!) Yet, bloggers as a whole seem hesitant to provide their e-mail addresses. We strive for comments and interaction, so why do we close ourselves off from private correspondence? Is it because of spammers? Are we scared of people getting too close? Or is our e-mail information just simply getting overlooked as we focus on all the other (social media) links we know we must remember to include? If spammers are the problem, I found this great site: http://aruntx.com/podcast/gogage/hosting.php, which allows you to enter in your gmail address to create an image that spammers can’t “read”.